Like most Cold War projects, the Air Force Weapons Lab Transmission-line Aircraft Simulator, or ATLAS-1, was enormous in every way. As much a work of deterrence theatre as it was a serious project to measure hardening of strategic assets, ATLAS-1 had to be big. By the time it was conceived in the late 1960s, much was known about the effects of EMP on civilian and military hardware. Having been somewhat accidentally discovered in 1962 during the Starfish Prime atmospheric nuclear tests in the Marshall Islands, which produced an EMP strong enough to disrupt electrical systems in Hawaii, EMPs were instantly recognized as a threat to military hardware that had to be dealt with. Testing on EMP hardening of military hardware, primarily aircraft, was conducted at a feverish pace throughout the 1960s, mainly at Kirtland Air Force Base outside of Albuquerque, New Mexico. The basics of testing were simple enough — build an electrical pulse generator big enough to simulate an EMP, aim it at an aircraft, and see what happens. At least 18 separate EMP test facilities were built, each designed to test different parameters as aircraft systems became more complicated with the introduction of avionics and flight computers. But almost all of these test stands suffered from a basic flaw — the aircraft under test was parked on the ground. This subjected them to a rapid double pulse of EMP, one incident from the pulse generator and another an instant later as the primary pulse was reflected by the tarmac. It could be possible that the double whammy would look powerful enough to kill an aircraft, while the same pulse in free space would leave the plane unharmed. Short of detonating a nuke in the atmosphere and watching what happens to planes, there are only two ways to test EMP on aircraft in flight: move the plane away from the ground, or move the ground away from the plane. Dr. Charles Baum, at the time a captain in the Air Force, was in charge of development of ATLAS-1, and he realized that the latter option was the more practical. He envisioned a large platform built entirely of dielectric material so as not to couple with incident EMP. The platform would be built to take advantage of natural features of the landscape so that the ground would be as far below the aircraft as possible, making it look electrically as if the plane were in flight. As simple as it sounds, the engineering behind ATLAS-1 was challenging, to say the least. Considering that the primary goal of the project was to test strategic assets like the B-52 Stratofortress and the E-4 National Emergency Airborne Command Post (NEACP), the modified Boeing 747 that serves as the “Flying White House” in times of emergency, the platform would have to be enormous. Given the weight of aircraft like these, the structure would also have to be enormously strong. Add in the fact that the supporting structure could contain no pieces of metal more than a few inches long, and some creative thinking was going to be necessary. While surveying potential sites at Kirtland for ATLAS-1, Dr. Baum’s team identified a natural arroyo near the end of one of the runways. The site reminded Dr. Baum of pictures of the old West, with railroads flying across sagebrush-covered valleys on sturdy trestles built of massive timbers. 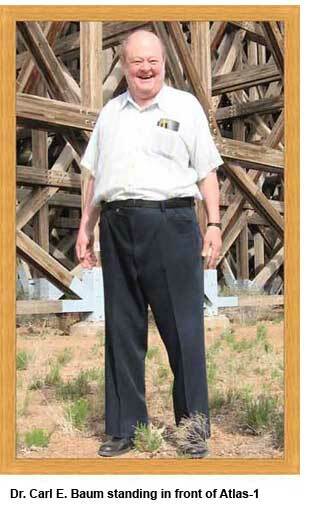 He reasoned that if a wooden trestle could be built to support a loaded train, certainly one could support a B-52. Thus was born the Trestle. The Trestle would take years to design and build. Everything about it was enormous — 200 feet (61 m) square, 120 feet (37 m) off the floor of the excavated arroyo, with a ramp 50 feet (15 m) wide and 400 feet (122 m) long to wheel planes onto it. Built almost entirely of Douglas Fir and Southern Yellow Pine, the lumber used in the Trestle and associated structures totaled 6.5 million board feet (154,000 cubic meters), consuming a sizable fraction of the output of the sawmills of the Pacific Northwest and Georgia for many months. The timbers specified by the structural engineers were often far too large to be milled from a single tree — some were as thick as 40 inches (1 m). These timbers were produced by glue-lamination, where thinner boards are glued up under heat and pressure to form massive elements. Some were so large that they took three railroad cars to transport and were placed with 20-ton cranes. Assembling these massive timbers into a structure that would be essentially transparent to radio frequency waves required innovative joinery. We’re all used to seeing wooden roller coasters, with thousands of timbers bolted together with galvanized bolts that are inspected and tightened regularly. But the Trestle needed to have no parts that could reflect the EMP back toward the plane, so huge bolts were out. Instead, dielectric fasteners on wood and fiberglass were used, in addition to small steel split rings set into joints to reinforce them. Even though the highly combustible structure was engineered to stand with a plane on it for four hours after catching fire, there was a suppression system laced throughout the timbers, which was, of course, entirely non-metallic. 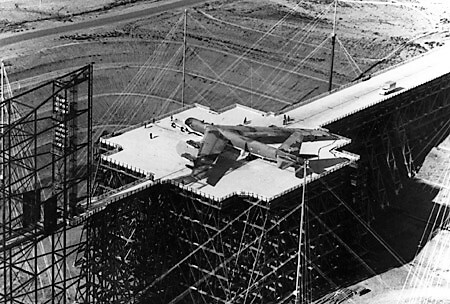 The result of all this engineering was a platform strong enough to park a B-52 on with its engines running, large enough to allow the plane to be positioned at multiple angles to the EMP, and still be electrically invisible. But the Trestle itself was not the only huge aspect of ATLAS-1. The whole point of the thing was to bathe aircraft in extremely high powered EMP, and the generators, or pulsers, used to accomplish that earned superlatives of their own. Housed in fiberglass structures filled with sulfur hexafluoride and sitting high above the end of the platform on their own wooden trestles, the dual EMP generators flanked a wedge-shaped steel structure that pointed directly at the platform. The Wedge was the only conductive structure near the test area and served as a ground plane for the Marx generators, which used banks of capacitors to discharge up to 10 megavolts into transmission lines strung above and to the sides of the platform. The transmission lines were connected to yet another wooden structure at the far end of the ramp that housed an enormous resistive load with a 50-ohm nominal impedance. The termination was considerably larger than the dummy load a ham might use to tune an antenna, though; the generators were capable of producing 200-gigawatt pulses lasting as little as 100 nanoseconds, which was perfect for simulating the effects of a nuclear-initiated EMP. Testing on planes began in 1980. Loading the enormous warbirds onto the platform was the most dangerous part of testing, especially for the B-52; while it’s belly landing gear was narrow enough to fit on the ramp, the outrigger wheels near the ends of the 185 foot (56 m) wingspan dangled over the arroyo, giving no support to the plane if it was to suddenly roll. Despite the dangers, no serious injuries were ever reported during the life of ATLAS-1. The facility conducted hundreds of tests on dozens of aircraft, including the B1B Lancer, every jet fighter from the F-14 to the F/A-18, and most of the aircraft of the Presidential Airlift Group. Progress would catch up with the Trestle, both in terms of politics and technology. By 1991, with the Cold War over and improvements in computers allowing better simulations, the need for destructive EMP testing was gone. The Trestle still stands in the arroyo to this day, baking in the high New Mexico desert. Efforts are afoot to preserve it as a national monument, which only seems fitting given how much engineering went into it. Aerospace and avionics engineers have done a great job of hardening aircraft against EMPs, including lightning, and other electrical disturbances. A not insignificant portion of the population has heard of threat of EMPs, but has no idea that any work has gone in to mitigating it, let alone how successful we have been at it. This write-up does a great job of showing off what our country has done, and I look forward to sharing it with anyone that has concerns about vulnerabilities to EMPs in aviation. Not to mention a termite’s dream home! That would be an awesome national monument. I wonder if they performed any sound, body and mind assault performance characteristics for passive shielding and ECM testing on the aircraft that is of the more heterodyne or pulse train or mind control type static, noise, interference and/or jamming? CSA SIGINT testing was more Dreamland based from what I’ve read and maybe is more a NRO or their ground based operations entities mission… so maybe not as I wonder if there is still a practical use for operational/performance verification testing. Good god I’d love to play with the equipment they used to generate almost nuclear-scale EMP. I remember seeing basic plans for a flux compression device in popular mechanics a million years ago and feeling tempted to build it. It consisted of a coil around a copper pipe filled with gunpowder. You’d blow it up, and the copper pipe would banana peel out and touch the coil, forming a short circuit that grew shorter extremely quickly as the shock front moved down the pipe. Thanks to conservation of energy, the electromagnetic flux would skyrocket at the last few turns of the coil, which I believe were at the focus of a parabolic reflector to give the device some semblance of directionality. Crazy stuff. So our so called great scientists could not think…. hey instead of putting a whole plane on a platform, why not just put the electronics up there. If it survives out side of the plane it will survive inside the plane. Sheesh think outside the box already. Because the very skin of the aircraft can affect how the EMP interferes and damages components inside. Would you rather have your drugs only tested in-vitrio or in human studies as well? Put in computer terms, no amount of unit tests will ensure the entire system will work as planned. This, every run of copper on the PCB, even the metal container will conduct the pulse. One of the big problems with an airburst nuke EMP is all the power lines that will collect the induced power and conduct it right into everything that is connected to them. A large enough EMP will knock out transformers, motors, generators, while diodes, ICs, transistors will have gone “puff” before the heavy metal does. A nuke disassembled at 180 miles above ground will EMP for hundreds of miles in every direction. Something like 3 nukes could knock out Consumer Electronics, (automotive ignitions, PCs, Cell phones and land lines, medical devices, radios, TVs, Internet, android tablets) over the contiguous 48 States. If that happens,.. food riots. For most. Farmers and survivalists most likely not. Mechanically injected diesels will still roam the earth like the dinosaurs that they are. Fortunately the wavelength of a nuclear EMP is long enough that it won’t really be picked up by any small device or appliance. The energy of the blast dissapates very quickly, and needs a large pickup antenna to do any damage. The concern is rather that it produces eddy currents in power lines, or on the hull of a ship or an airplane which then bleeds into the electronics. Regular lightning suppressors are enough to protect your home from an EMP. Your cellphone won’t explode in your hand. The effect of a nuclear blast EMP is rather because it’s such a long wavelenght that it induces a very low frequency wave into the power grid, which puts high DC-like currents through the transformers and saturates them, which prevents the grid from balancing itself out. It’s like you suddenly remove all the transformers in your grid – where there is power, there’s too much power, and where there isn’t any everything shuts down. The EMP pulse has multiple components, E1 being the fastest that produces a passing high voltage potential of some kilovolts per meter. E3 being the slowest part of the wave that actually damages powergrids like a geomagnetic storm. If you have an EMP right over your head, and get 22 kV/m electric fields, some of your non-ESD protected devices may fail or glitch. Thing is, there’s already such fields present. We already live in an environment where there’s charge differentials all around, about 100 Volts per meter is just normal and people often zap their electric devices with 50,000 volts of static electricity from their fingers. The fact that you don’t instantly destroy your Arduino board simply by holding it in your hand is because modern semiconductors and devices have been made robust against these discharges, and by proxy, more or less immune to EMPs. Luke, normal ESD testing is done up to 10kV (contact) or 20kV (air discharge). 50kV would be a taser like discharge of >=20mm. This level of static can probably occur under very extreme conditions, but this is very rare. Kind of like I noted with the Cross Sectional Area (CSA) in my other comment signals information. There are “skin” and other physics EMF materials related as well as their shape related effects. So like a CAT scan takes multiple measurements to produce 2D and 3D images of the target. Technically, forward thinking, if we want to know those hidden variables related to the target before they happen so not really hidden to some… then the better modeled effects from a who, what, when, where, why and how perspective will be documented clearly or clear enough somewhere as a resource to provide information for the next person or group coming into the situation… as I was taught, blind to the situation. Then with the informational resource reference, the future can make considerations in regards to optimizing designs proposed. Because that’s not a rigorous test at all. That’s like doing a crash test but instead of an actual car you use a bunch of crash test dummies in a bucket or something. Those results aren’t useful. “The [some number] wonder of the world”. The U.S. Navy used to dedicate forests for use in, I want to say, specific ships preventative and ongoing maintenance. I guess came to mind thinking about dedicated sites operations and since this site is made from wood where later thoughts for the non-renewable resource recycling or re-use came to mind. The composite materials are more a pain, though with the metal and plastic components seems heat treating and other methods are easier. Might be an area of opportunity in the future, thermoset composite material recycling/re-use. About 15 years ago, I saw stacked near a Navy pier in Washington state, large timbers, approximately 15 by 15 inches, dozens of feet long. I was told they would be placed on ships for repairs/shoring. I think of the ship that had its bow blown off during a Pacific battle in WWII. In a nearby cove, they cut down palm trees, shaped them and fashioned them into a makeshift bow to get it back to the States for repair. Though after further reading I found they’re still active with Naval Support Activity. Maybe materials command does stuff with wood also? In 2011, a cache of old numbered oak timber was found buried in mud at the Charlestown navy yard near Boston. It was probably there for about 100 years. A project working to restore a whaling ship in Connecticut was able to pick up the timbers, which was handy because their other sources were running low. Here in the UK we have forests which were deliberately planted to build future naval fleets. I recall seeing a photo of a B-52 on the Trestle in an Air Force magazine sometime back in 1979-1980. I’ve seen the BUFF several times, in specific museums. Four are in retirement in the air museum in Pima AZ, and there’s a big crowd next door in the boneyard. And of course one there in Dayton OH. Also one in CA at Castle AFB Museum. I believe the country does not completely realize how much we owe the military and especially the BUFF. I’d never realised how BIG they are until I saw the one they have at Duxford here in the UK (that’s the Imperial War Museum’s Duxford branch). They built a new hanger just big enough to house it, and have still managed to fit about another twenty or so US aircraft in the hanger with it, many tucked under the wings. I really really must go to Duxford. Couldn’t you just use a huge crane to lift the aircraft and then fire the EMP from underneath (away from the crane of course) then it would just be sky behind it, nothing to reflect. The crane might have too much metal and thus interfere with the test. The crane gantry or boom would be above the plane. And there might be a risk of the EMP damaging the mechanisms of the crane, which could make it difficult to lower the plane back to earth after the test. Quote: But almost all of these test stands suffered from a basic flaw — the aircraft under test was parked on the ground. This subjected them to a rapid double pulse of EMP, one incident from the pulse generator and another an instant later as the primary pulse was reflected by the tarmac. It could be possible that the double whammy would look powerful enough to kill an aircraft, while the same pulse in free space would leave the plane unharmed. Thanks for a most interesting bit of history, but that quote has some strange reasoning. In a sudden Soviet attack, aircraft were as likely to be “parked on the ground” as “in free space.” They should be able to survive both. And talking about aircraft having their instruments knocked out in flight, the Navy is issuing the pilots of several of its aircraft Garmin watches to deal with a troublesome situation where the aircraft’s instrumentation becomes unreadable due to problems in the environmental control system. Here are the details. The Trestle took TWO MONTHS of lumber production for the ENTIRE USA. The corner notches are there to save lumber. Dr Baum was an active member of the local IEEE chapter. Quite a character. I know and have worked with pulse power engineers who knew him quite well, either as his students, or they worked for him. I find it hard to believe the annual US lumber production is only 6x what is in the trestle. If the claim was 2 months of timber production from a certain region of a certain type I’d find that much more believable. “Dr. Baum” sounds really funny in this context as “Baum” is the German word for “Tree”.